These mutual funds and ETFs are worth a look right now. The stock market has gotten more turbulent lately, and investors are uncertain what impact the U.K. Brexit vote will have on the global economy. In addition, the 2016 U.S. presidential election and a host of other geopolitical and macroeconomic factors have those following the market wondering how to invest right now. With that in mind, below you'll find some thoughts on three index-tracking mutual funds and exchange-traded funds that could fit well in your portfolio. Take a look and see which one looks like the best bet for your investing strategy. Tim Green: High-flying growth stocks may be exciting, but value stocks tend to outperform in the long run. According to a study from Bank of America, while growth stocks have returned 12.6% annually since 1926, value stocks generated a far more impressive 17% annualized return. For investors who don't want to pick individual stocks, value-oriented funds offer a great alternative. The Vanguard Mid-Cap Value Index Fund (NASDAQMUTFUND:VMVIX) is a good choice, giving investors exposure to about 200 mid-cap stocks with an expense ratio of just 0.2%. 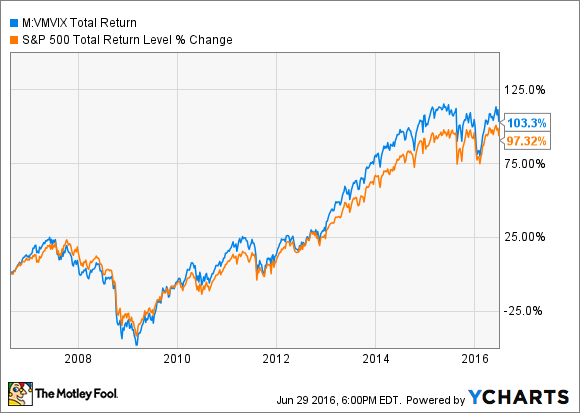 The fund has outperformed the S&P 500 over the past decade, and while this doesn't guarantee future outperformance, the fund's value investing strategy should work out well in the long run. VMVIX Total Return Price data by YCharts. There are some risks associated with this fund. First, nearly 25% of assets are invested in financial companies, which may make some investors uncomfortable given the uncertainty surrounding interest rates. Second, some of the fund's top holdings aren't what I'd call value stocks. Graphics chip company NVIDIA is the fund's largest position, and while the stock was certainly a value stock a few years ago, that's no longer the case. NVIDIA trades at an eye-popping 43 times earnings following a multiyear rally, making it a dubious choice for a value fund. Despite these shortcomings, the Vanguard Mid-Cap Value Index Fund looks like a great way to implement a diversified value investing strategy without needing to pick individual stocks. Dan Caplinger: Whenever markets get turbulent, cautious investors start to look at the value of having dividend stocks in their portfolio. The Vanguard Dividend Appreciation ETF (NYSEMKT:VIG) and the matching index mutual fund that Vanguard also offers (NASDAQMUTFUND:VDAIX) include nearly 200 high-quality dividend stocks, and the index that it tracks identifies stocks based on a couple of important attributes. Specifically, the Vanguard Dividend Appreciation funds follow the Nasdaq U.S. Broad Dividend Achievers Index, which doesn't just look for high dividend yields. The index focuses primarily on companies that have a long history of giving their shareholders dividend increases on a consistent basis. That's the main reason why the fund's current yield of just over 2% isn't all that strong compared to the market average. By choosing one of these funds, an investor acknowledges that maximizing current income isn't as important as finding stocks that will grow that income over time. With an expense ratio of as little as 0.09%, Vanguard Dividend Appreciation charges less than most similar dividend-oriented funds. The Vanguard Dividend Appreciation funds are a smart choice for those who want to generate income from their portfolios and want the volatility-fighting power of dividend stocks. Todd Campbell: Global tensions are on the rise, and with the U.K. vote to exit the EU and a pending -- and potentially divisive -- U.S. election on deck in November, one of this year's best-performing indexes is the S&P Metals & Mining Index. 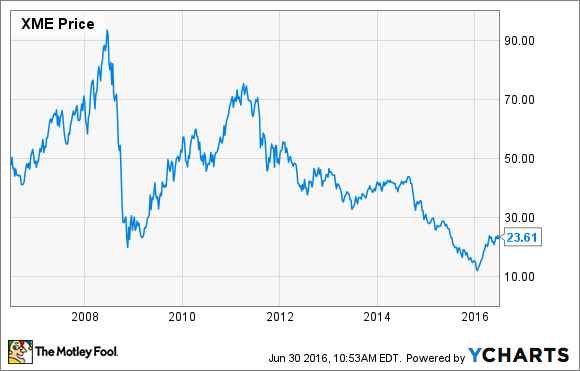 Until recently, the S&P Metals & Mining Index ETF (NYSEMKT:XME) has seen hard times. It's sunk from over $65 to $23.50 in the past five years. However, a growing interest in gold has boosted precious metals prices lately and that's providing profit tailwinds for many of the companies in this index. As a result, the XME is up more than 55% this year. Admittedly, this ETF isn't for everyone. It's best suited for aggressive investors who can handle the risk of another commodity downturn. But, investors with a penchant for bargain hunting might still find value in this beat-up industry, especially since many other industries are still trading near their 52-week highs. If you do buy this ETF, you'll end up companies like Cliff's Natural Resources, a major iron ore producer, and a slate of gold and silver stocks, including Hecla Mining, Coeur Mining, and Newmont Mining. Among this ETF's top 10 holdings are five companies with gold and silver exposure, and those stocks represent over a quarter of the ETF's total assets. Because precious metals miners make up a big proportion of this ETF, it may offer investors some protection as we navigate Brexit and election year uncertainty.